This annotated collection of the influential philosopher's most famous works includes: Metaphysics, Logic, Physics, Psychology, Ethics, Politics, and Poetics. Aristotle was born at Stageira, in the dominion of the kings of Macedonia, in 384 BC. For twenty years he studied at Athens in the Academy of Plato, on whose death in 347 he left, and, some time later, became tutor of the young Alexander the Great. When Alexander succeeded to the throne of Macedonia in 335, Aristotle returned to Athens and established his school and research institute, the Lyceum, to which his great erudition attracted a large number of scholars. After Alexander's death in 323, anti-Macedonian feeling drove Aristotle out of Athens, and he fled to Chalcis in Euboea, where he died in 322. His writings, which were of extraordinary range, profoundly affected the whole course of ancient and medieval philosophy, and they are still eagerly studied and debated by philosophers today. Very many of them have survived and among the most famous are the Ethics and the Politics. Bambrough, Renford; Creed, J. L.
Bambrough, Renford, Creed, J. L.
3. 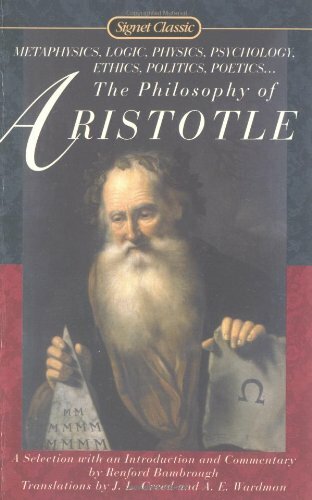 The Philosophy of Aristotle (Signet Classics) Bambrough, Renford; Creed, J. L. and Wardman, A. E.